With Geelong done, and Devonport and Mooloolaba just around the corner, we’re well and truly into the pointy end of the season. It’s the time to find out how effective training has been – with Devonport being my first race this season after a taper. To be honest, I am extremely excited to be back racing again after a 12-week break. I am feeling stronger than ever and most importantly I am looking forward to finding out what I am capable of, not racing tired! Myself and Steve O’Brien (aka coach) headed across to Geelong for the USM events Geelong Multisport festival. I was competing in the 16-19 age group in the Olympic distance race. Heading into the race I was unsure of how I was going to fair. The plan was to go as hard as possible for the swim and bike. With the recent training performances and with specific sessions focusing on swim starts every Sunday morning, I was quietly confident. Race morning brought calm and clear waters, the perfect recipe for a fast swim, you beauty! With the open and 40+ age group wave starting only 5-minutes in front of us, it was not long until we had bridged the gap making the swim very crowded. After playing pinball for a bit with some other athletes, it was very welcoming to be at the front of my wave, coming out of the water in a time of 19:57 for the 1500m swim. Now onto the bike where I hoped I could do some damage! The Geelong bike course is slightly hilly and highly exposed to the wind, which can be very tough at times - which suits me. For the first 20km it was highly congested out on the course, this made it very hard to avoid drafting. The second half of the course was much less congested and gave me the opportunity to see what position I was in. No one from my wave in front of me, one person on my wheel - the guy I was battling with for first in my age group! So I decided to drop the hammer and put down some speed knowing that the guy I was battling with was a good runner. I managed to get a gap coming into transitioning to the run which meant the battle for first in the 16-19 age group was on! I went out hard on the run, holding a very fast pace for the first 1km - which hurt, but I wanted to hold onto the lead. But, not long after the 1st km into the run my opponent had caught me - I tried to hold on but I could not hold the pace. So I settled in to a pace and kept at it. Surprisingly by the 6km mark I had somehow bridged the gap to be back in contention for the win. However there was one thing in the way, a short and steep hill only 2km from the finish which would be the decider. Unfortunately my legs said no one the day and I was dropped, but I was able to hold onto second in my age group. Crossing the line in a time of 2 hours and 1 minute 30 seconds, I had just set a massive personal best and gained equal 8th overall. I was extremely happy to crack the top ten overall and this has given me a massive confidence boost. I achieved my goal of going as hard as possible on the swim and bike and having a solid run. I’m now more motivated than ever to push hard in training and continue to enjoy the sport of triathlon. Geelong was a great opportunity to test out the hard work myself and everyone else involved with the Fuse Multisport team has put in over the past 3-months since resuming training after the World Championships, and a handy lead up event for Devonport. Whilst Steve and I were over in Geelong, my team mates Matt Galbreath, Ben Tripodi, Robbie Buckley and Erin Heard were competing at the South Australian Olympic Distance Championships in Kingston, South Australia – where they smashed it, with Ben taking out 3rd in the open male category and Erin winning the open women’s event. In other news we just received a shipment of goodies from Brooks Australia. Some new runners and running gear have come in extra handy for racing and training. 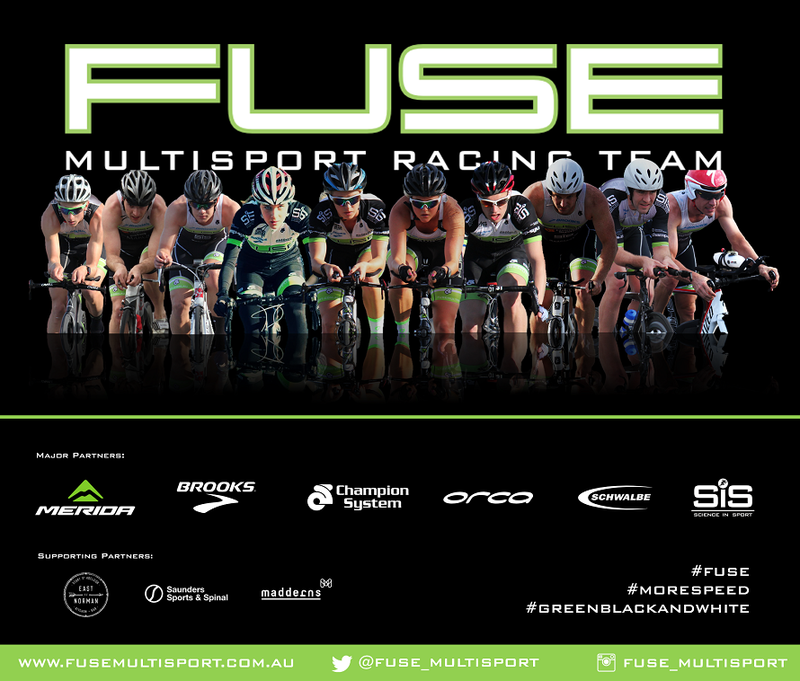 I can’t thank them enough for the support they give the Fuse Multisport team. Also, I think I would be passed out somewhere in the Adelaide hills if it were not for Science in Sport, their Go Gels have saved me from collapsing on more than one occasion, thanks guys. Another shout out to Andy and the guys from Champion Systems Australia who just recently organised a ride along the coast with fellow Champion System athletes. It was a great experience getting to ride with riders from all over the country, really appreciate it.